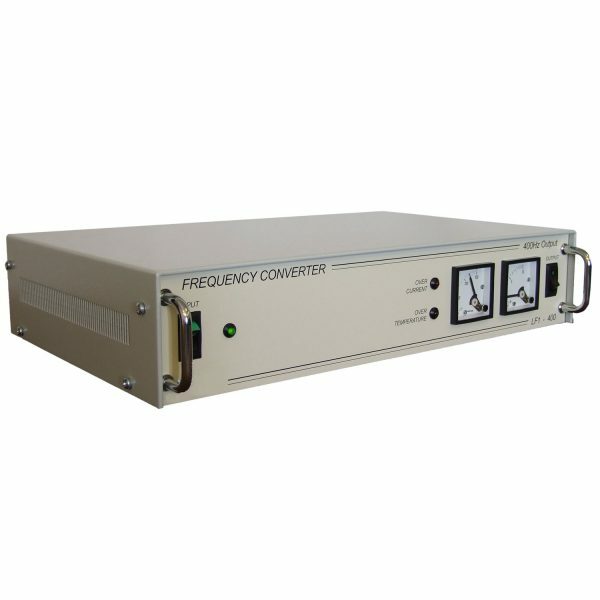 RBC4000 series Frequency Converters provide the most cost-effective and flexible way of providing 400Hz and 60Hz for workshop use. By using the most advanced electronic design, RBC4000 models offer a remarkably compact, quiet and robust converter. This means that personnel may work in close proximity to them without the tiring noise normally associated with 400Hz 60Hz converters. RBC4000 series machines are suitable for installations within plant rooms and workshops. These units are commonly used for powering production lines, test and development laboratories and simulators. An oversized rectifier and robust IGBT based inverter offer high reliability, while modular construction and a simple lay-out means that access for maintenance and repair is very straight forward. Mains Supply Frequency: 50 or 60HZ +/-5% (other frequencies available on request). Power Factor: 0.99Pf @ full load. Input Protection: MCB to BS EN 60898. Protections: DC over-voltage protection, mains low protection and input surge protection. Technology: Full wave controlled thyristor / diodebridge with IGBT power factor correction. Voltage Regulation: Static +/-1%, Dynamic +/-6%. Frequency: 50, 60 or 400HZ +/-0.1% (other frequencies available in request – 16-850Hz). Distortion (THD): <3% into linear load. Load Power Factor: 0.3 lag to 0.3 lead. Overload (KVA): 120% continuous 121% for 2 minutes, 160% for 5 seconds without reduction in output voltage. Efficiency: 90-93% depending on system. Protections: Electronic overload / short circuit, over-temperature, inverter over/under-voltage and low DC shutdown. Technology: High Frequency, pulse width modulated IGBT with isolation transformer. Noise Level: <55dBA @ 1 metre. Maximum Relative Air Humidity: 90%, non-condensing. Maximum Altitude: 2000m Above sea level before de-rating. Max / Min Temperature: 0 – 40°C.